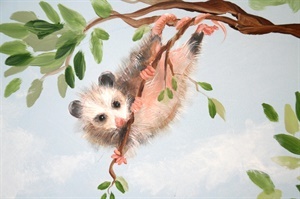 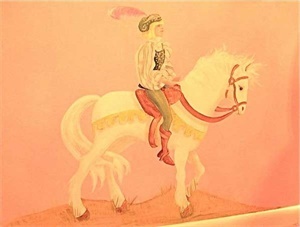 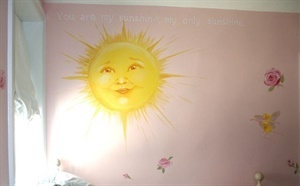 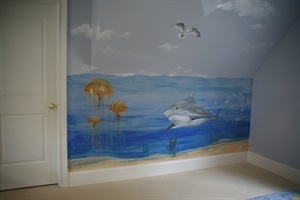 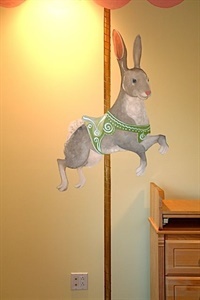 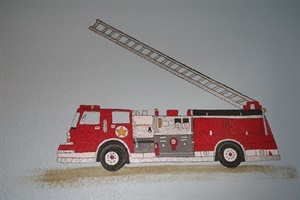 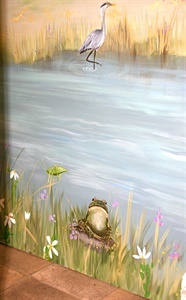 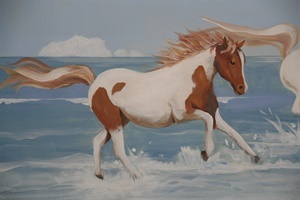 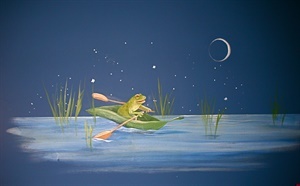 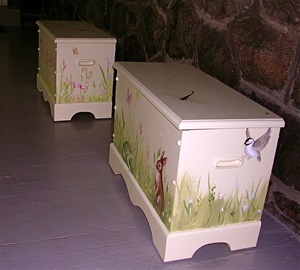 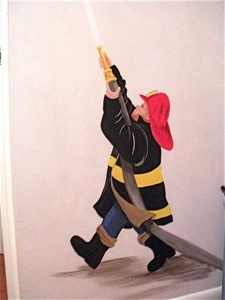 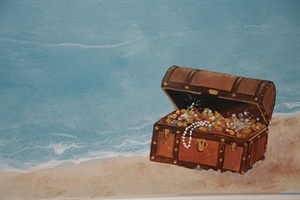 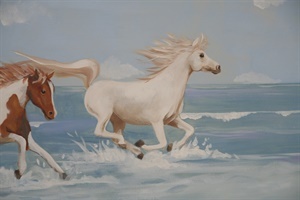 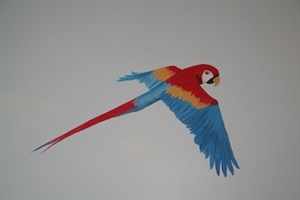 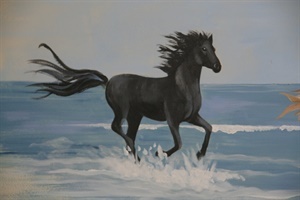 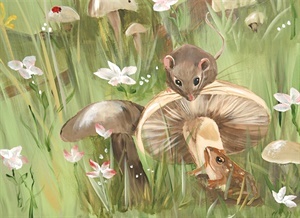 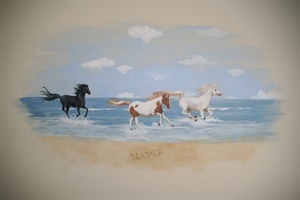 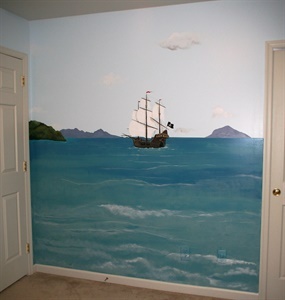 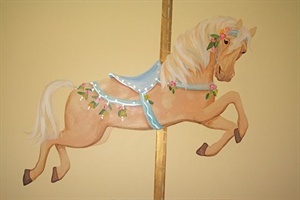 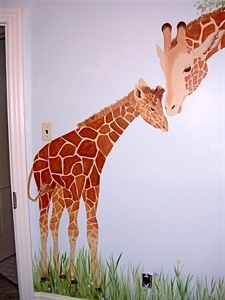 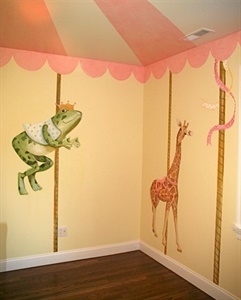 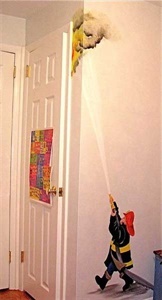 Murals for nurseries and bigger kids' rooms; walls, ceilings, floors, furniture. 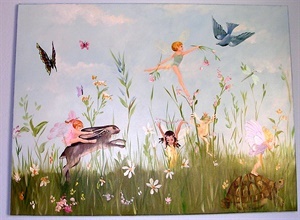 A small vignette, scattered fairies, a flowered border, or a whole-room fantasy environment! 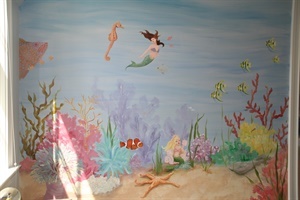 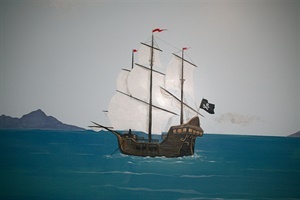 Also, see the "Murals" page for information about Movable Murals! 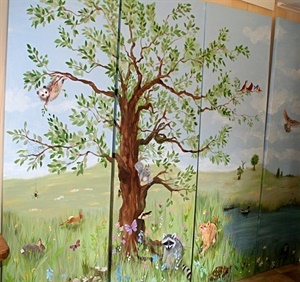 Two sliding closet doors at New Gulph Children's Center in Villanova PA.
Painting for a little girl's room--acrylic on a stretched canvas. 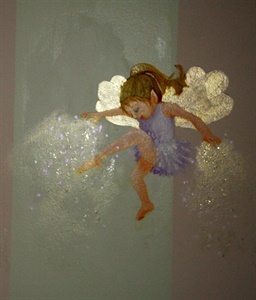 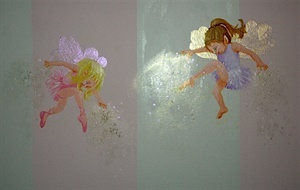 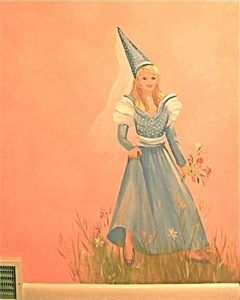 She sprinkles fairy dust over the changing table in a little girl's nursery. 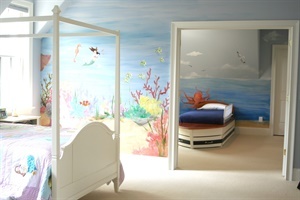 This room was inspired by a couple of paintings the client had bought. 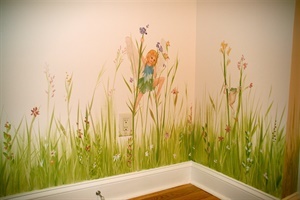 The walls were colorwashed, and loose handpainted flowers scattered all around. 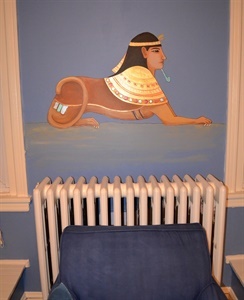 A border was added to the chair-rail, and the window shades and bench were painted to match. 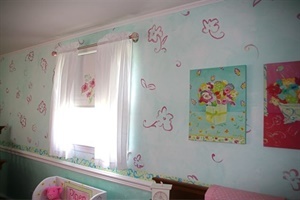 Scattered roses and fairies, a happy sun in a little girl's room. 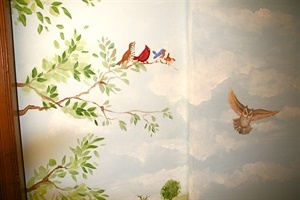 The words to a favorite song are written all around the top. 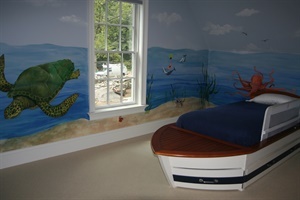 The client had a special baseball carpet made for his sons' bedroom. 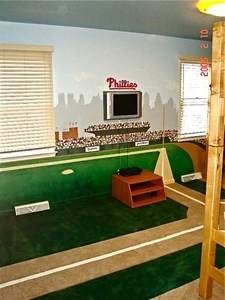 We painted two walls to continue the field and depict the Phillies' stadium. 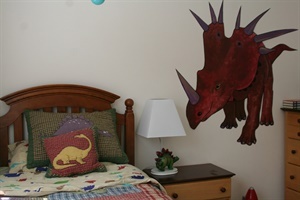 More pictures can be seen at www.weaverfamily.org/kidsroom. 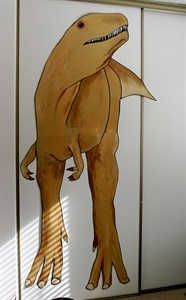 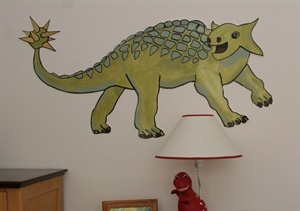 Huge dinosaurs were cut out of light, flexible, polystyrene, painted with acrylics and hung on 5-year-old Evan's walls. 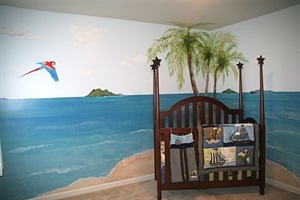 He chose the dinosaurs, his mom chose the colors. 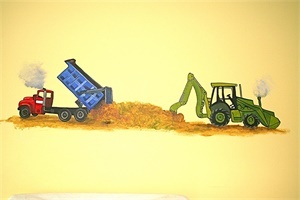 They can be easily removed and rolled up when Evan tires of them or his family moves. 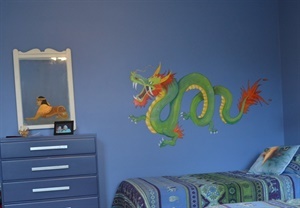 $350 original on the wall; $50 for printed"sticker"
Chinese dragon over a boy's bed; the Sphinx on the opposite wall can be seen in the mirror.